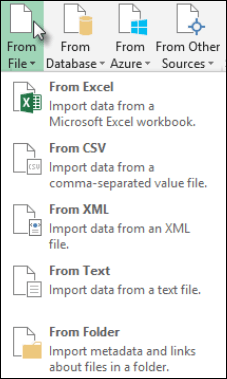 Use Excel's Get & Transform (Power Query) experience to connect to Text files. Click the Data tab, then Get Data > From File > From Text/CSV. If you don't see the Get Data tab, click New Query > From File > From Text. In the Power Query ribbon tab, click From File > From Text. See the following video on how to display Query Editor. In the Browse dialog box, browse for or type a file path to import or link to a file. After the connection succeeds, you will be able to preview the lines of text in the file.